As I write this update, the day is slipping away, it’s just after 2pm, and we are fast approaching the shortest day of the year. Which is when we are most in need of the sparkly lights and candles, that – for me – make this dark time of year bearable. 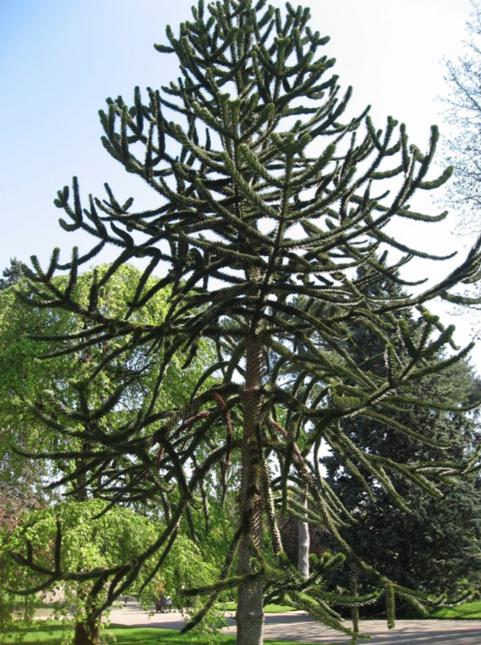 But there’s always the latest monkey puzzle update to brighten your day! And this is a bumper instalment of Monkey Map for Yule, a bit like the Whizzer and Chips or Beano annual, but you don’t have to wait for December 25th for this gift! BD, Graham in Keighley has very enthusiastically joined the Monkey Map team, and his finds were updated in the previous post – here. BN, at the derelict Shoreham Cement Works, BN6. Agent Philip sent me a very dramatic photograph of a single tree against huge concrete industrial buildings. I discover it was taken by Richard Chivers in 2005, and he’s written the photograph here (and you can see his image there). 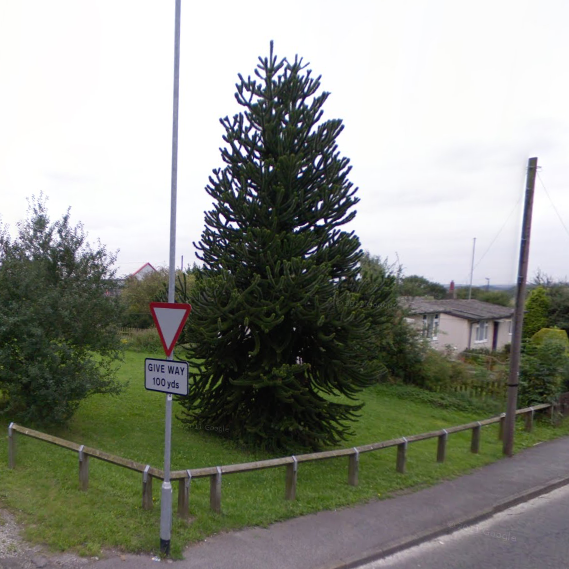 I have asked him for permission to reproduce the photograph here, but in the meantime, this is an image from Google, ten years later, and the tree is surrounded by derelict static caravans… bizarre. 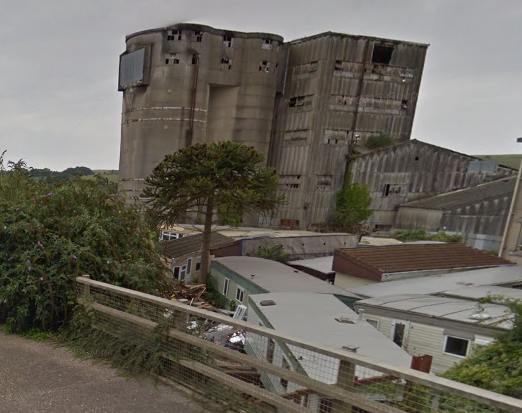 The Shoreham Cement Works site is up for redevelopment, a bit like a hobbit holiday camp…. equally bizarre! BS, behind the Langley Arms in Emersons Green, BS33, thanks to Charon for this. CH, well no update is complete without Agent Philip’s contributions. 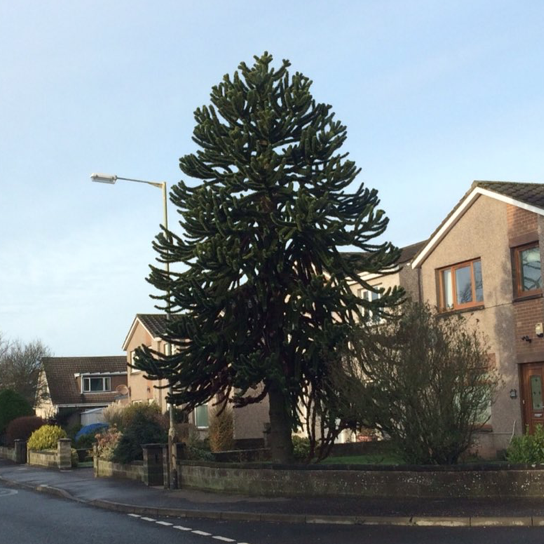 So we have CH151 and CH152 in Breezehill Road in Neston – little and large. CH153 Bushell Road also in Neston. CH154 in Poulton Road in Wallasey. 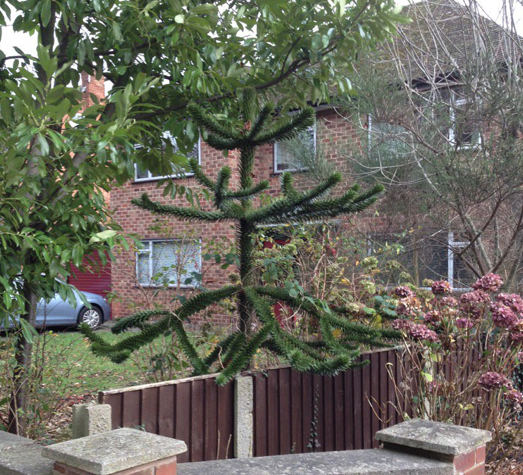 Agent Millwall MPT thinks this tree is ‘divine’, nice and straight! Agent Philip is very good at spotting trees behind fences that no-one else would notice! 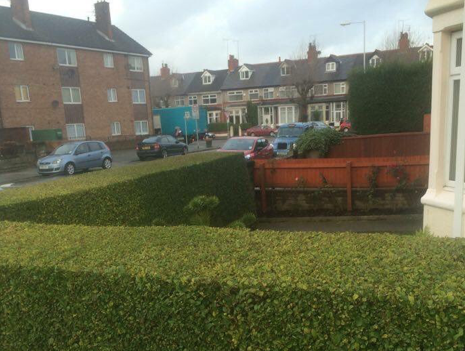 And, finally in CH, this little newbie CH155 peeping over the hedge in Burton Avenue in Wallasey, actually spotted by Josh Honeybourne. 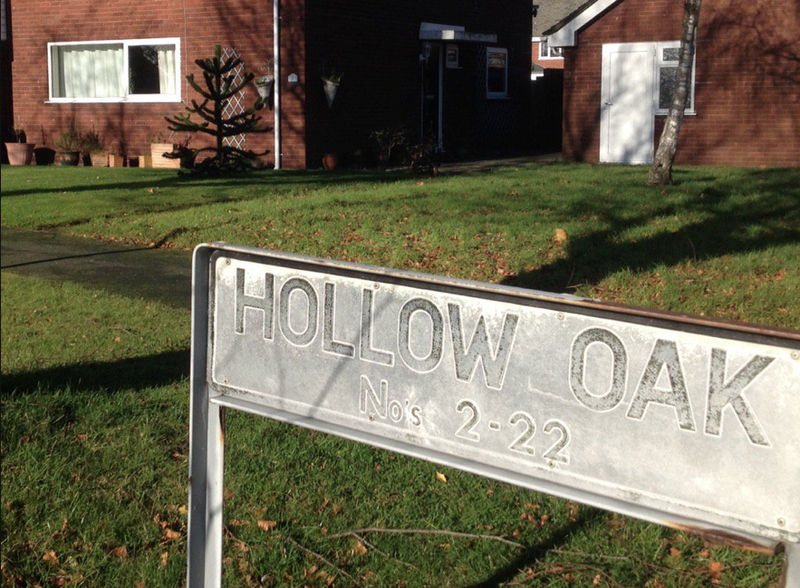 CW, also from Agent Philip, CW39 in Hollow Oak Lane in Northwich. Philip observed that we seem to be obsessed with tree names for roads. DD, two here from our lovely doglets Edwin and Hubble. First at Silverwells Garden Centre in Arbroath where they’ve shopped for years (at least their ‘mum’ has), and never even noticed this! DD113. And just along the road, another fine specimen, DD114. DG, also spotted by the lovely doglets, Agents Edwin and Hubble, at Lochnaw Castle Estate, an ‘exotic garden estate’ which you would expect to have monkey puzzle trees. Nearby is Castle Kennedy with a very fine collection in an avenue. At Lochnaw the doglets sent me a photograph of trees that had been felled after storms, but even with several cut down trees, you can see at least three standing. I think one of our Scottish agents need to investigate further! I have catalogued three trees there for now, DG46 to DG48, but I suspect there will be a good few more in an avenue. DT, from Agent Green, DT2 and DT3 in Crossways. 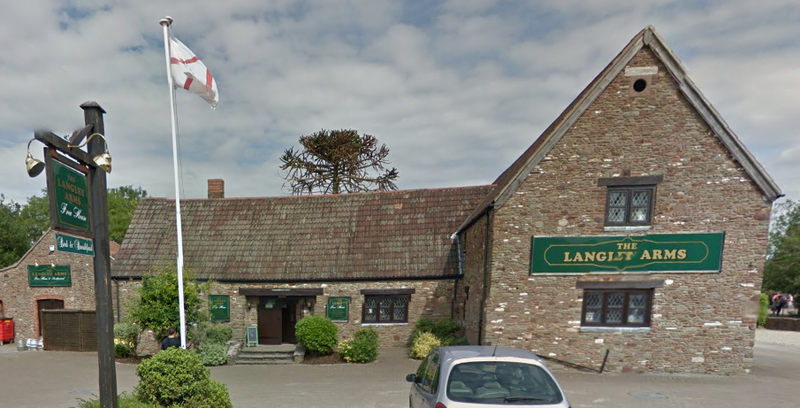 The owner of DT2 wants to cut it down – you can read more on Agent Green’s blog here. 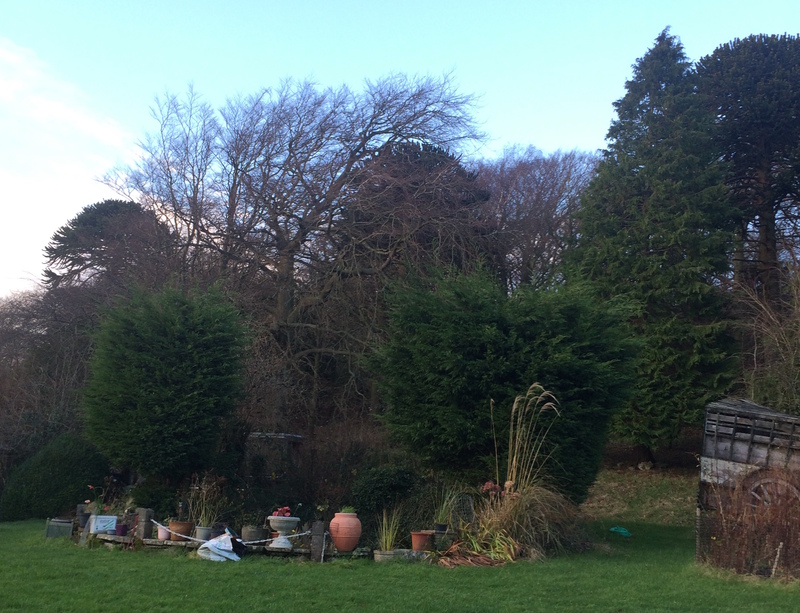 WC – unfortunately there are not many green spaces here, I’ve been looking for quite a while as I work in this area but unless there’s one in a private garden I can’t see I’m not too hopeful. Would be really happy to be proven wrong. EC – same problem as WC when it comes to green spaces, though there are more private residences with gardens so more likely to have a hidden tree somewhere. I work on the EC/WC border and have been recently wandering the streets without any luck. EH, many thanks to Fiona Inches from Edinburgh Botanic Garden who very kindly sent me a map showing the location of the eight trees they have, and the RGBE references too. I had mistakenly catalogued two of Matthew Pottage’s older photographs as additional trees, but they are photos of two of the trees when much younger, so after a quick recatalogue EH1 and EH2 are now vacant and I await more from EH to fill them! GL, on my recent visit to Stroud we went to Westonbirt Arboretum, and here is Sampson, Gemma’s little black dog, encountering a group of monkey puzzle trees there. He’s looking a bit unsure! Agent Gemma spotted these, five young trees in the Silkwood, certainly at least one of them was planted in 2005 (according to the label), and they are GL26 to GL30. HA, Uxbridge Road in Pinner sent by Apel Mjausson. LA, an interesting find from Agent John in Fife, reporting in from his Silverdale base. Carl, who owns the building and about 10 acres was happy to show me his trees. There are 12 in total, including one seedling from the trees above. Carl tells me they were planted 150 years ago as part of the arboretum of the rich industrialist who built the mansion as his summer home. Part of the ground floor is leased out and serves as a bar and Carl lives on the top, and the house is home to Carl’s charity which gives adults with mental health issues a place to work in the gardens and learn estate skills like dry stone walling and hedging. 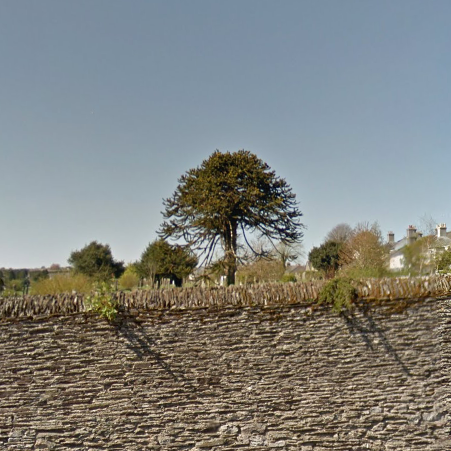 John found out that the four Townsfield trees, just down the road – here – are progeny from seeds from these trees. 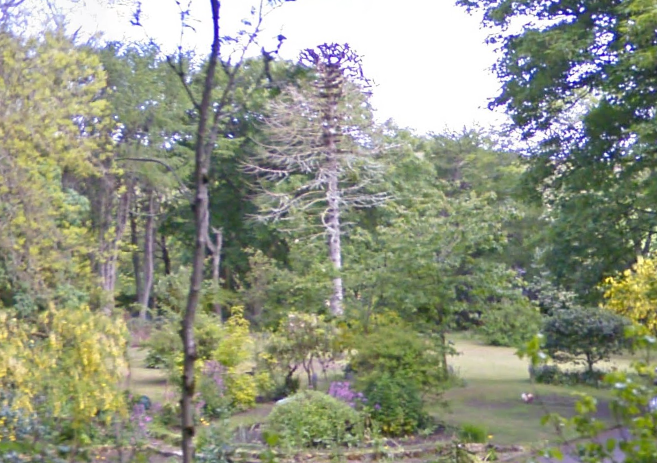 The only history of the house I can find tells me that in 1873 a Bolton cotton spinner, John Hebden, came to Hill House (now the Woodlands Hotel), and must have been responsible for planting these trees which would have been the ‘must have’ tree of the day, and a show of wealth. 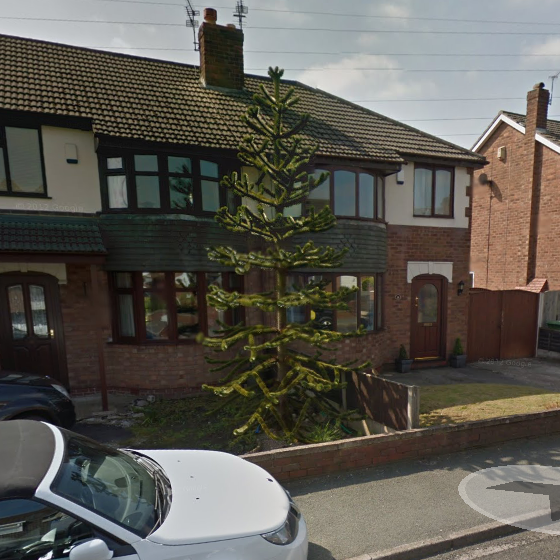 LE, one in Coalville from chriscaff, LE10, which has fruited for the last two years. 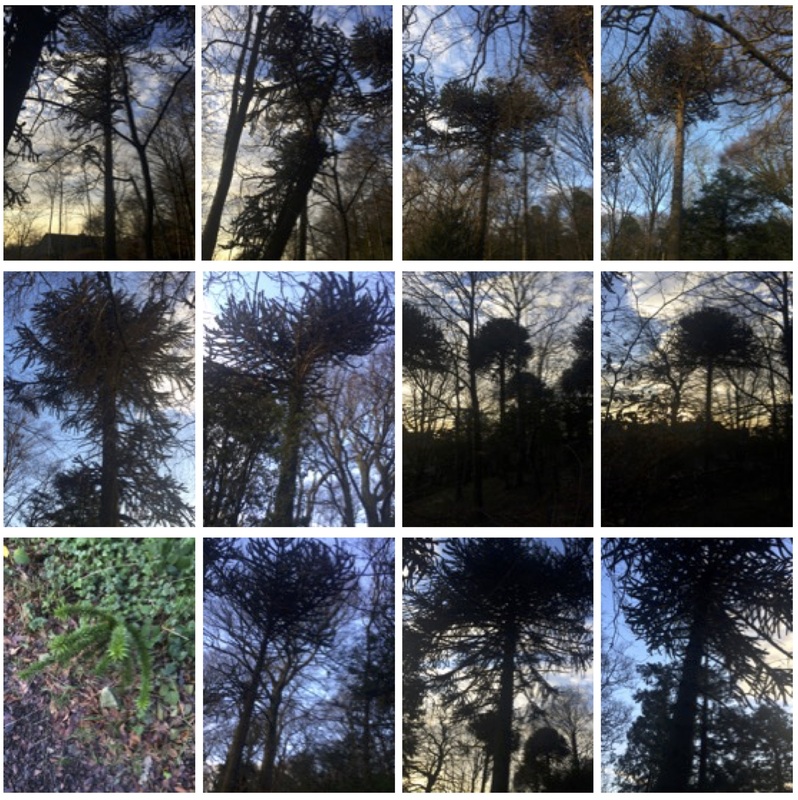 This is avery underrepresented part of the country, eight of the ten in the catalogue here are in Bradgate Park. LS, a couple sent in after the Radio Leeds mention. 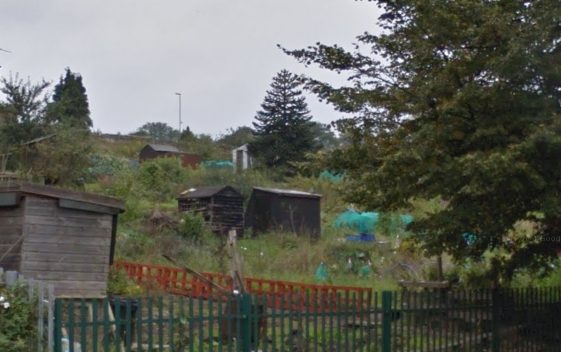 LS108 at the Gledhow Valley allotments, from Val Codling, it’s on the next plot to hers. How nice! I am biased of course, being an allotment holder myself, but I do think they enhance any allotment site. And LS109 on Wood Lane from Unity3. ME, a lovely tree ME29, sent to me from Sue Batchelor in Rochester. 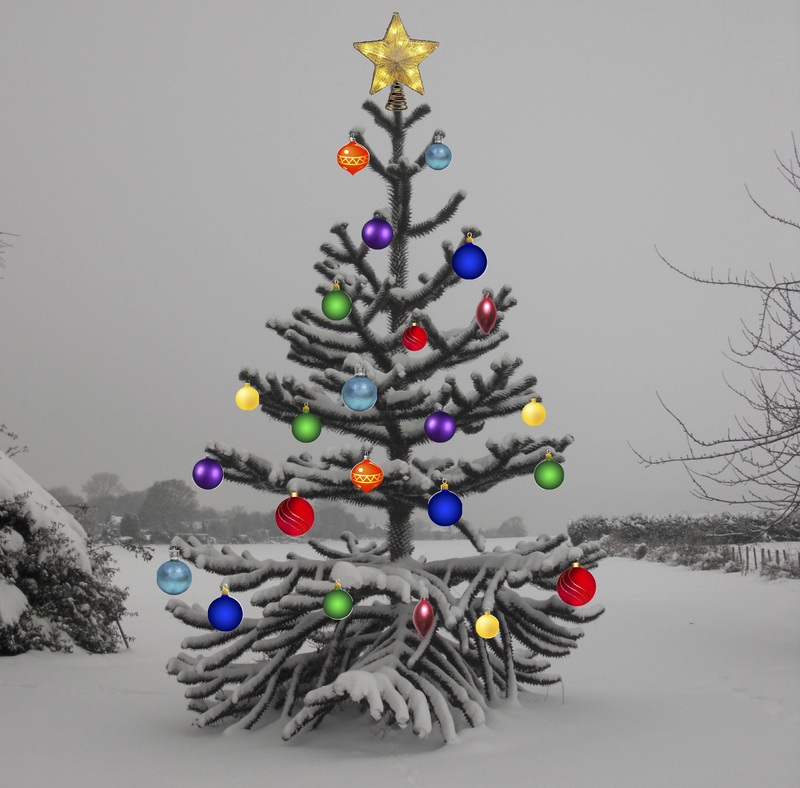 ME29 is the tree at the top of this post, a lovely snow photo which was just asking for some yuletide additions! 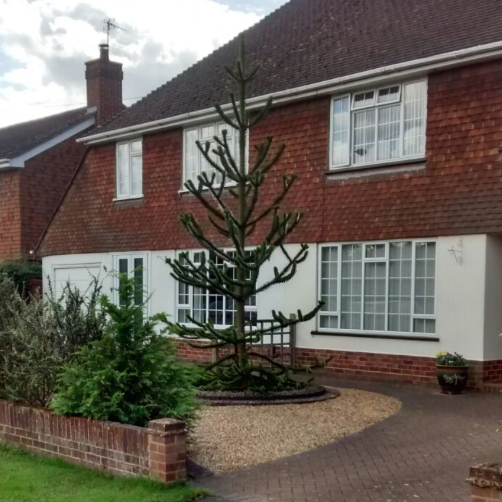 Sue said, ‘We planted our monkey puzzle tree twenty plus years ago, it came from a friend in Hayling Island when her parents moved house. 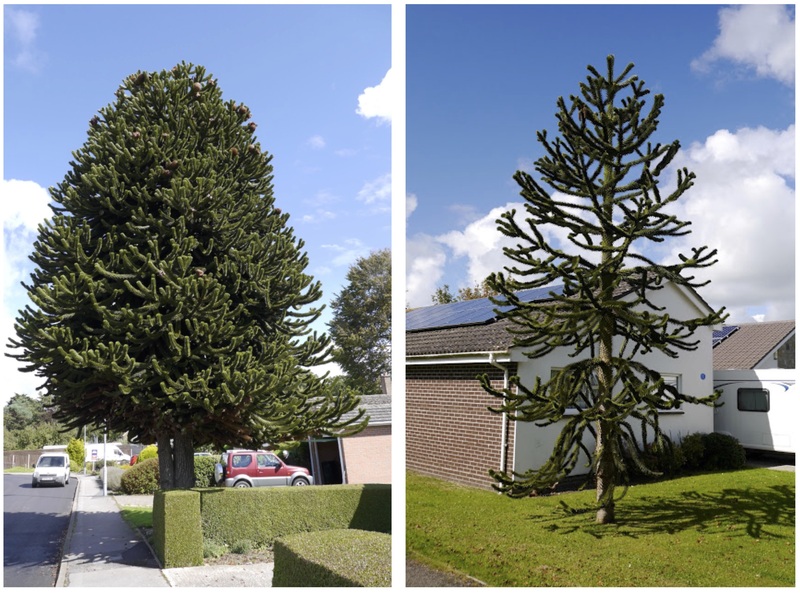 They wanted the monkey puzzle to go to a good home!’ Well it is certainly thriving here. 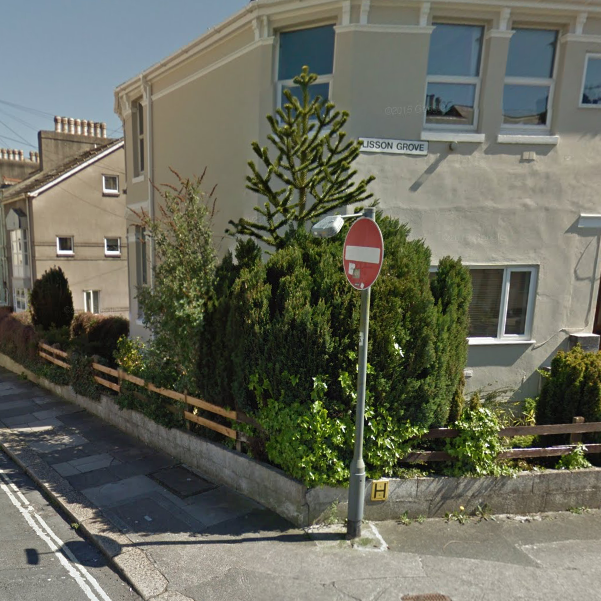 PL, in Plymouth, thanks to Joe Hignam, here’s PL329 (SX 48661 55820). And PL330 – a nice specimen in the Ford Cemetery (SX 47875 55914). 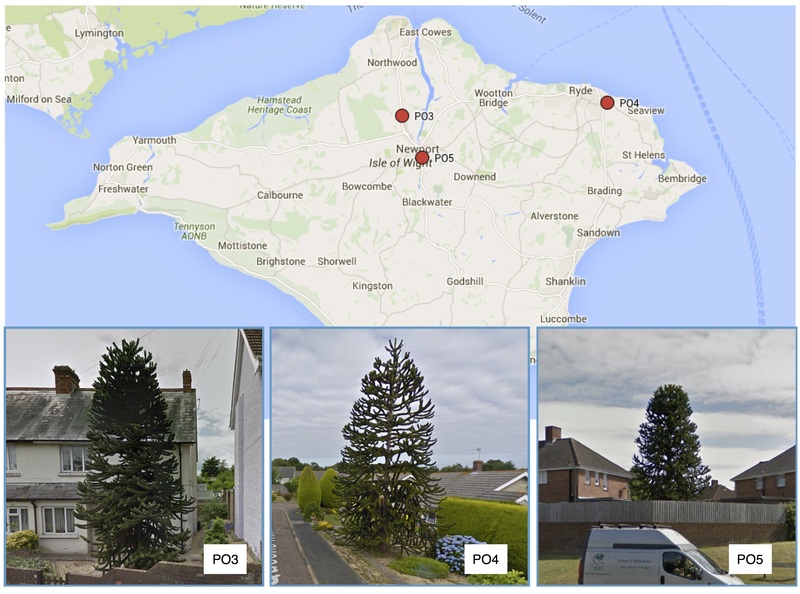 PO, first trees from the Isle of Wight thanks to David Mansfield. RG, Agent Green again with RG7 in Woodley. 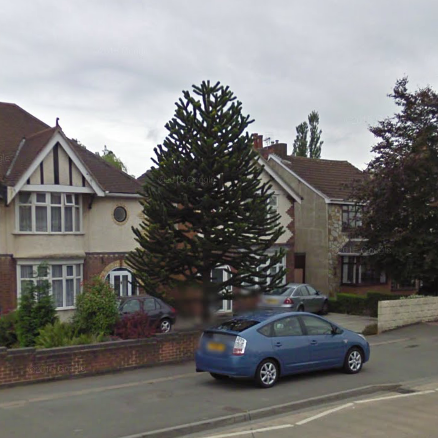 Michael Buck said his neighbour has one in Ellington Drive, and this is RG8 (quite small), which I was able to find on Google. 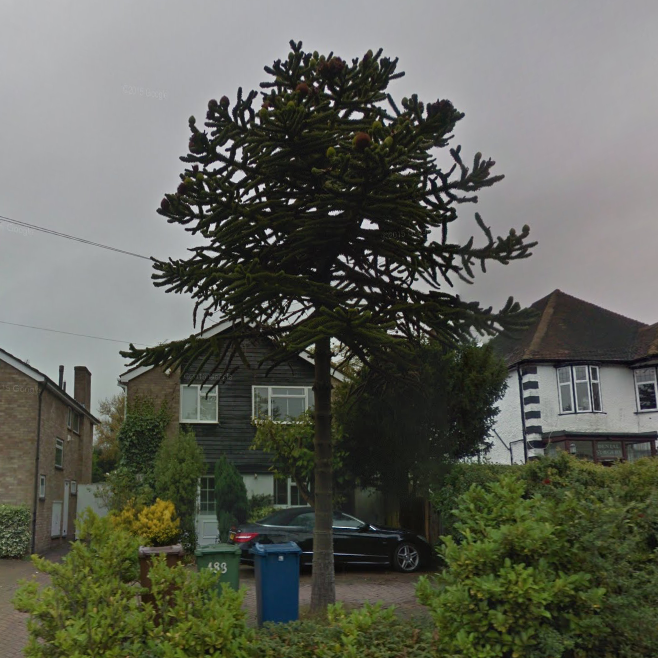 SE, nice to hear from Agent Dragonblaze with this tree in Ferndale Road SE24, catalogued as SE30. ST, no picture for this, but Charis tells me there is one (or more?) at Trentham Gardens near Stoke-on-Trent if anyone is visiting. 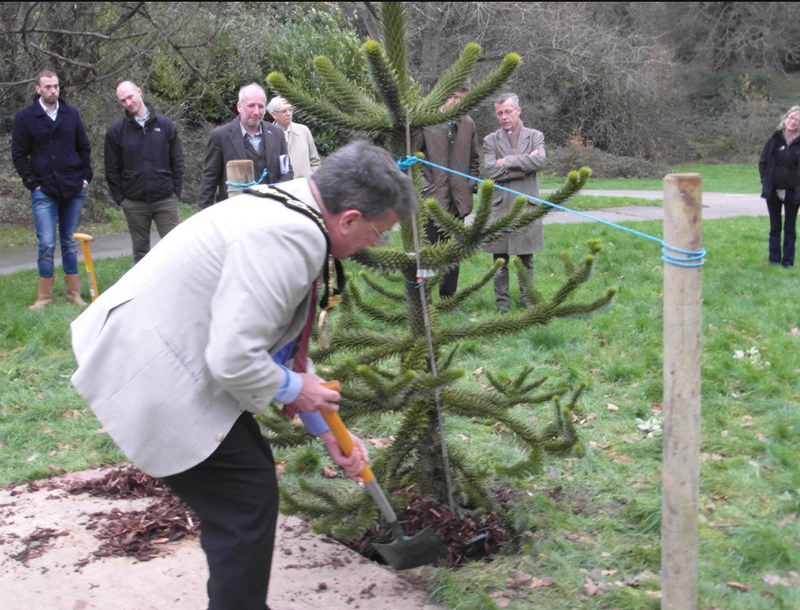 TN33, a new tree being planted in Grosvenor and Hilbert Park in Tunbridge Wells. 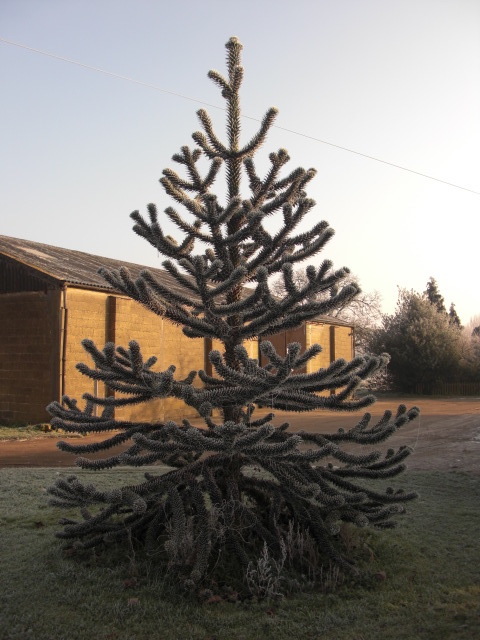 I found this image in my ‘to do’ folder and can’t find any further details about the tree or the event – perhaps someone can let me know if they have any? 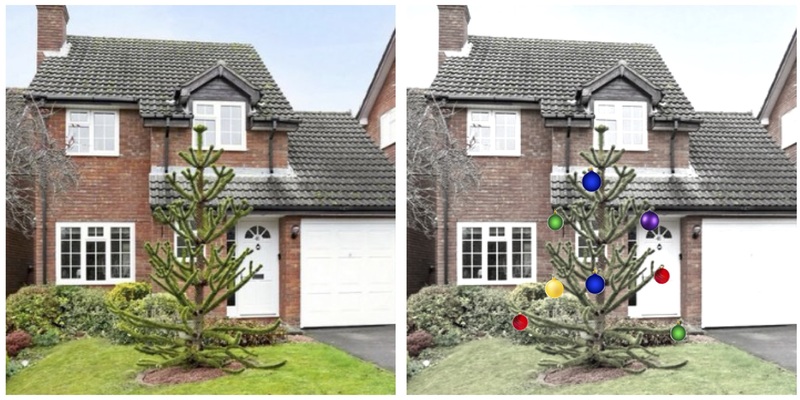 SO, as marketed by an estate agent on Twitter – Fantastic ‘monkey puzzle’ tree could be decorated for Christmas outside your NEW home!? – this is SO11 in Winchester, with said decorations. A snip at £435K! 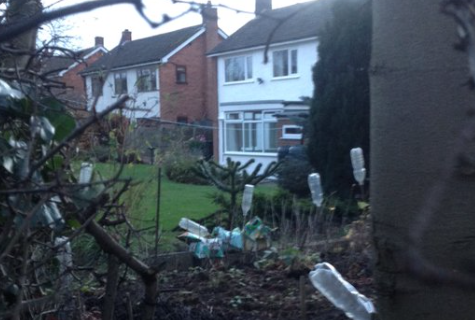 WA, Andy Smith, gardener, so plenty of opportunity whilst out and about to spot trees, sent this from Warrington WA12. ZE, the elusive ZE, our most northerly postcode in the UK. Agent Green tracked down a forum that mentions a MPT near Kergord Burn. 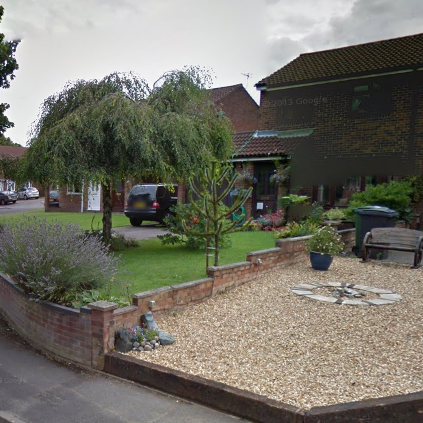 Had a look on Google maps and have found what looks like a dead MPT in a garden in that area. The Rough Guide To The Shetlands mentions a tree at Kergord House, which may be this one. This is the ZE find. So, not a tree in ZE as such, but I think an award for tenacity is due to Agent Green. Good work! International finds next, with our first tree in Paris, FRA3, in the Jardin du Pré-Catelan, image found here and sent in by Tim Morton. And Agent Baxter having found the most northerly monkey puzzles – in Norway – immediately went of to find the most southerly tree. He’s been in touch with the British Antarctic Survey office in Stanley in the Falkland Islands. 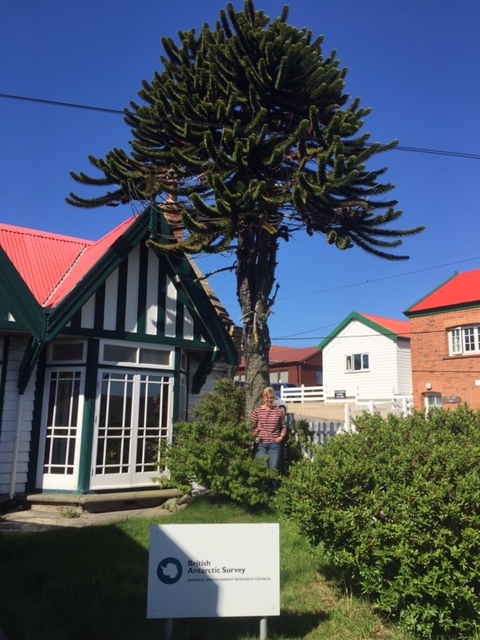 And here is Pauline Sackett next to her Monkey Puzzle tree in Stanley, The Falkland Islands, FLK1. Good work Agent Baxter, but we expect no less! 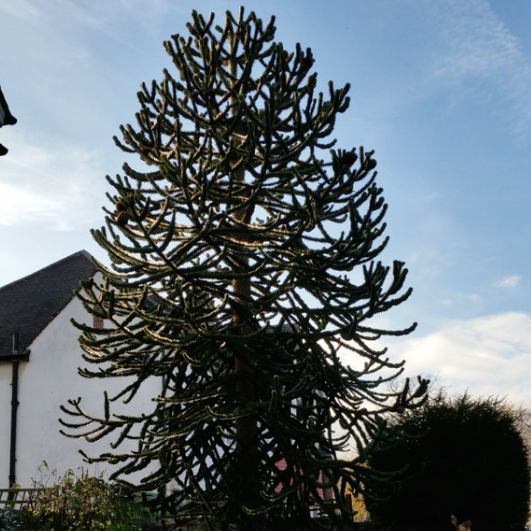 Also in ‘monkey news’ (if there is such a thing), the sad loss of a monkey puzzle tree in Pontypool, which fell on a school building – fortunately this happened during the night when the building was empty. This tree wasn’t on the catalogue, but always sad to lose a tree. Thanks to Agent Philip and Agent Sew for spotting the news. 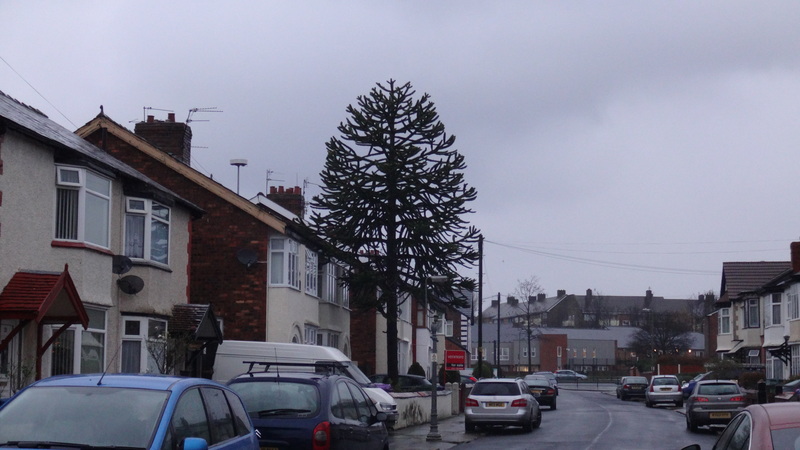 It is with great sadness the we can report and confirm that the monkey puzzle L90 in Talbotville road Liverpool has been felled. Such a disappointment! Yes, this was one of my favourite Liverpool trees, and could be seen above the rooftops from Queens Drive flyover, I remember visiting last December and taking this gloomy photo. But I hope P and N will continue to keep their eyes peeled and add any new finds to the catalogue. 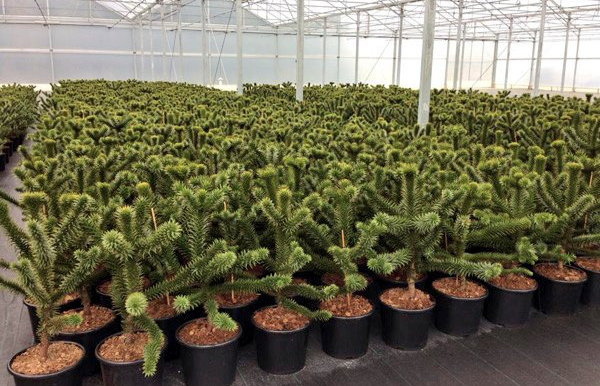 And finally, after those sad stories, an image that’s bound to make any monkey puzzle fan go ‘Ahhhhh‘! 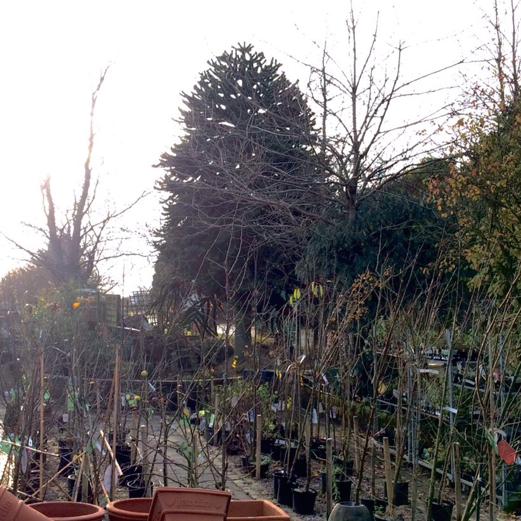 Thanks to Sophie Leguil for this lovely photo of a Belgian nursery. So that’s the bumper instalment of Monkey Map for Yule. If I have missed any finds out or made any errors with names/locations, please do let me know and I will correct. And remember, keep your eyes peeled. This ‘Monkey Map’ project is a personal project and the work of me, Sarah Horton. I am helped by my task of cataloguing all monkeys by keen monkey puzzle hunters who also do this in their free time. It is a work of personal passion and brings me great joy. Thank you everyone for your support. 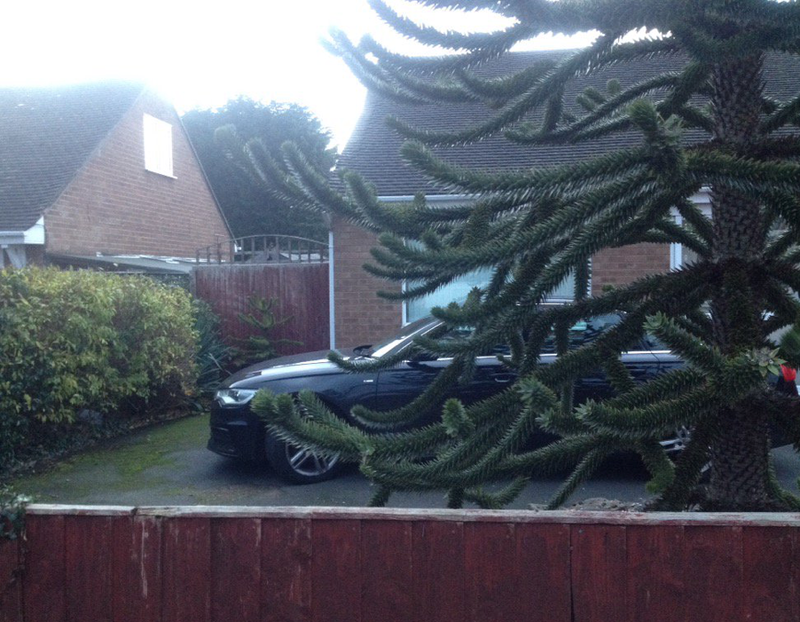 This entry was posted in monkey puzzle and tagged BD, BN, BS, CH, CW, DD, DG, DT, EC, EH, FRA, GL, HA, IE CO, LS, ME, PL, PO, RG, SE, SO, ST, TN, WA, WC, ZE. Bookmark the permalink. In some ways the best photo is the first photo, with a monkey serving as a Xmas Tree. Some might say a monkey makes a better Xmas Tree than a normal fir tree. I wonder if there are any more out there? The cement works monkey looks so threatened. I guess there is a TPO on it. Thanks for putting on the blog the Falklands monkey. They are having sunshine and blue skies down there. It looks too big to be adorned with Xmas decorations.